IDC Gives XtremIO an Awesome Birthday Present! A few weeks ago we celebrated the one-year birthday of XtremIO. 365 days since the product was declared generally available. A few days ago, IDC published its all-flash array market share numbers for the first half of 2014“Worldwide All-Flash and Hybrid Flash Array Market: 1H2014 Vendor Shares and Market Outlook,” (doc #252304, November 2014). 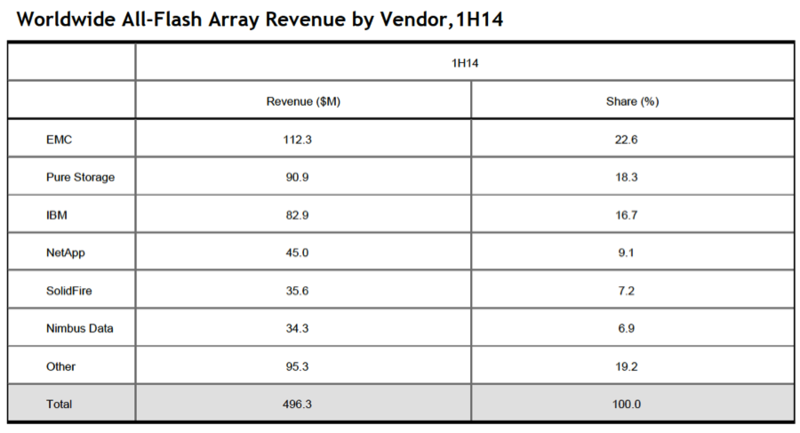 XtremIO was ranked #1 in all-flash array vendor revenue in 1H2014. The amazing thing is not this achievement. It’s that XtremIO is accelerating at an unprecedented rate. EMC already stated in its Q3 earnings call that XtremIO exceeded a $500M run rate in Q3. This makes XtremIO the fastest growing EMC product ever and we believe that EMC and XtremIO will have an even wider market share lead when full year 2014 market share numbers are reported. IDC’s data validates unequivocally that we reached the #1 market share position in the all-flash array market after shipping product for only 7.5 months, against competitors who have been shipping product for many years. This IDC all-flash array market share report is an achievement — proof of execution. The flash array market is hotly contested because the potential growth is so huge and technology inflections create opportunity for every vendor to gain market share. In this market XtremIO is your safe harbor – chock full of innovative technology, the #1 all-flash array in 1H’14, and all delivered with the rock solid stability and support of the leading storage provider in the world. It isn’t often that you can purchase the best technology in a disruptive market from the existing #1 vendor. But with XtremIO and EMC you can. Your job is safe with us. To learn more about what sets XtremIO apart, please visit xtremio.com or read this blog.